Tsubasa is a pretty well known anime/manga. It’s created by Clamp which is an instant plus for many people. To think that Clamp would make a shounen series that featured a lot of intense action was a little out there right? Angelic Layer had some amazing fights as well, but this time the stakes were real. This anime doesn’t play out like an average shounen, so can it stand the test of time? Well, the main plot stays for the entire series, but the subplots change according to each world. I’m getting a little ahead here so let’s go back. The series starts out with Cardcaptor Sakura and Li Syaoran as they’re in a desert world. Sakura seems to get possessed and ancient symbols of magic appear. 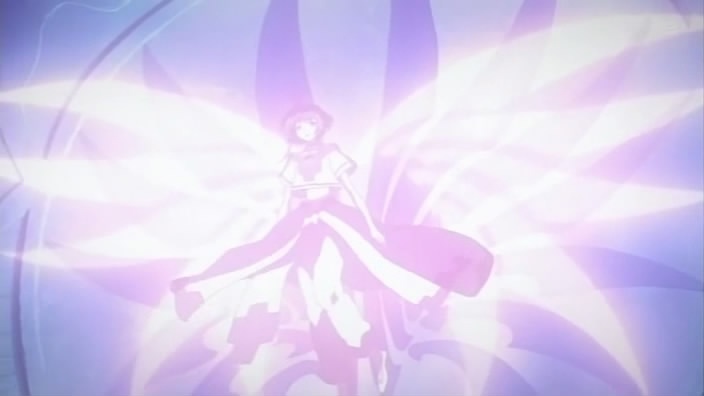 Sakura floats into the air and then loses her wings as Syaoran saves her. Out of portals that seem to lead to another dimension, mecha guards with claws attack them. Good thing that we have a magician and a swordsman to back them up. The magician tells Syaoran to leave the planet and help Sakura. They do the only natural thing that could be done in this situation and escape the entire dimension. One thing that I’ve got to mention is the fact that episode 1 was extremely good. It’s still one of the best episodes in the series and was a great way to start off the series. Not only was the episode fast paced, but a lot of things happened. The villains appeared (With an Awesome theme!) and acted pretty tough. They’ve got a nice plan that they won’t actually reveal for the entire series, but everyone likes a little mystery right? We also get to see glimpses of two other dimensions as Fai and Kurogane also leave their dimensions. Kurogane was forced out while Fai went willingly. Again, I must stress that this is only the first episode! While things do slow down from this point, that was the perfect way to start off the series and must be one of the best series premieres out there. I really can’t think of many that could top this one. (Yugioh Zexal II (If you count it) could stack up against this one) Syaoran, Sakura, Kurogane, and Fai are the main characters of the series so let’s go into some detail about them. The four of them meet the Space Witch who agrees to let them travel the dimensions, but at a cost. Syaoran wants to find all of Sakura’s memories that have turned into feathers and scattered across the dimensions. His price is the fact that Sakura can never remember the good ole times they had in the past, so Syaoran will be permanently cut out of her memories. Syaoran pays the price so he’s all set on that end. Fai’s price is the seal on his back because it means a lot to him. Without the seal, Fai has decided not to use magic anymore. Kurogane is forced to give up his legendary sword and with that, all three prices have been paid. Sakura is unconscious, so she doesn’t have to actually pay a toll. The four of them head off with Mokona (A being who can travel across dimensions, sense emotions, and has around 107 techniques) to other dimensions. Mokona can sense if a feather (memory) is nearby and once they have found all of the feathers in the dimension, then they will head off to another dimension. All right, now we’ve got our formula for the series! At first, Kurogane is really just tagging along because he can’t really do anything about it, but he comes around eventually. Fai is always extra cheerful, but it seems to be an act part of the time. Syaoran is really all business and he’ll do anything to get the feathers back. Sakura starts the series as a pretty weak character for a while, but whenever she gets a feather, more of her strength returns to her. I can’t get into every dimension that they travel to, but I’ll mention some of the big ones. In one dimension, they head to a world where people can use the powers of Kudan! It’s essentially a way to summon animals and use elemental powers. Syaoran meets a guy named Shogo and they have some battles. This is the first dimension that they travel too, so they’re still a little rusty. Syaoran is definitely the best character at this point and he definitely intends to get all of the feathers back. One scene that may be notable is the fact that Syaoran says that he’ll get the feather back no matter what. The feather is stuck inside one of the monsters, but Syaoran rips it out. He didn’t seem to care if the guy died, since the feather was the only thing that mattered. Perhaps, he cared a little bit, but not enough that he would pause in his quest. This was a pretty good dimension and a nice place to start things off. Next up, they go to a dimension where evil dictators have harnessed the powers of the feather. (Did I mention that Sakura’s feathers are immensely powerful objects that have nearly unlimited power?) 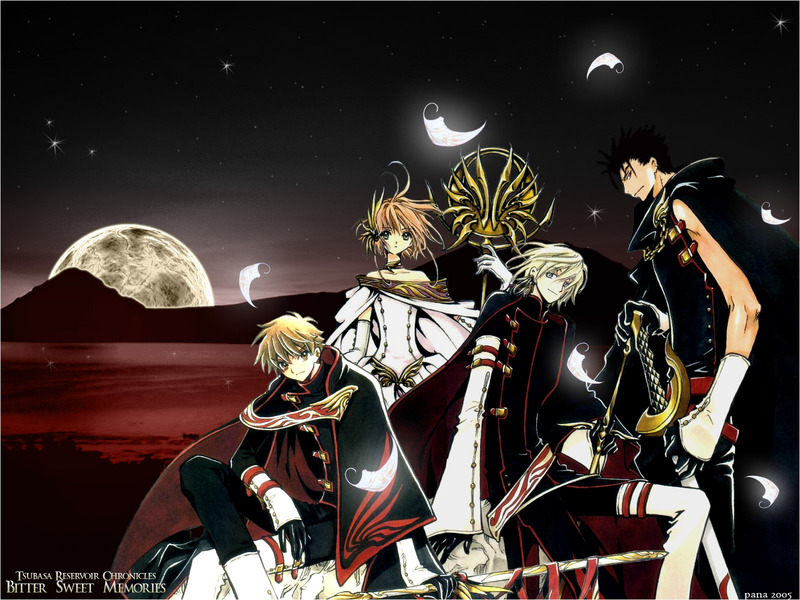 Syaoran and his friends go to stop these fiends and the battles commence. This arc possibly had even more action than the Kudan part and I’d say that it was more interesting. 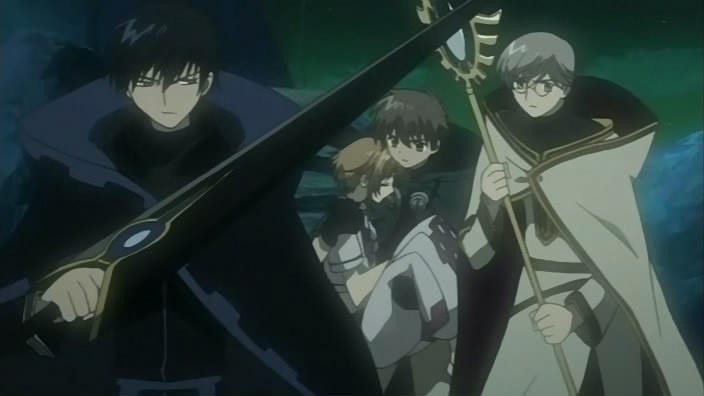 While Syaoran takes on the dictator and his son, Fai and Kurogane battle Kiishimu. Kiishimu is a witch whose abilities have never been seen in their entirety. Needless to say, she’s a pretty powerful opponent. Fai could possibly have defeated her with ease, but he has vowed never to use magic. Oto Country is one of the next dimensions that they travel too and it’s pretty exciting for several reasons. One of these reasons is the fact that the plot seems to finally advance. This dimension has demons and the stakes enter their highest at the time. Kurogane teaches Syaoran how to fight with a sword and they take on many demons. Syaoran wields a fire sword while Kurogane wields a blue sword. A mysterious figure shows up and the plot really starts to thicken. The man seems to know Syaoran and he’s also after the feathers. He manages to grab one and we find out that he can cross dimensions at will. This makes it virtually impossible to trap him and finding him could definitely be tough. He fights with Fai, Syaoran, and Kurogane in three separate battles. Let’s just say that one character may not have completely made it through that part. This guy definitely makes for a compelling villain and he was a pretty solid character. His sword has a very cool design and he’s possibly the strongest character at this point in the series. Season one ends with a decent episode that wasn’t great, but it did have a nice battle at the end. For those who don’t read the manga, it may seem like a really important episode since Fei Wang sends his army in to take Syaoran and friends down. 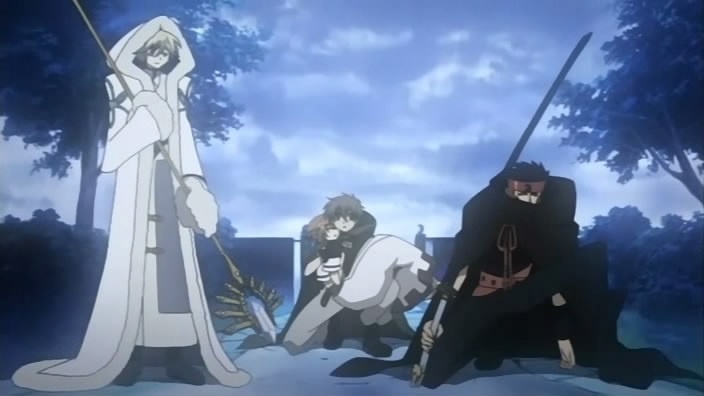 Fai and Kurogane stay back to stop the minions while Syaoran and Sakura make it to the top floor of the temple. Can Syaoran defeat the leader of the assassins? It definitely makes for a pretty epic fight and the episode was a nice way to end the season. One of the dimensions that they visit in season two is a place where there’s a huge library. We finally see Kurogane’s origin and learn more about his reason for fighting. He has a debt to settle and he intends to settle it soon. This planet is pretty important since Fai also makes a crucial decision. Syaoran also starts to feel the influence of the other Syaoran a little more. Quickly, I should talk about that part. Part of Fei Wang’s ultimate plan seems to involve Syaoran as he has a (Clone?) Syaoran locked away in a water tube. This Syaoran is able to take control of the other Syaoran from time to time and he seems to be a little…meaner! Beyond that, Fei Wang and his partner never reveal what their true plan is so I hope you like mysteries. We never learn why they want the feathers or why they just want to wreck Syaoran’s life. Finally, the series ends with a dimension that involves royalty. Chaos is the King and he believes that Sakura should travel with him instead of Syaoran and friends. He has dozens of feathers and he can travel across dimensions. Obviously, he’s more qualified to help her on the quest right? Syaoran and friends don’t think so, but he is able to defeat all three of them. They put up a decent fight, but this is the final boss of the series! He’s immensely powerful and he seems to outrank them all in everything. With everything on the line, can Syaoran defeat this guy!? Those are just some of the dimensions that Syaoran and friends visit during their travels so I recommend watching the series to see the rest. The animation is very good for the series and it holds up well. The soundtrack is dynamite and it has some really good themes in there. There are 3-4 different opera type music that I like a lot and we even get a battle theme. The villain theme is certainly the best in the series and you’ll find yourself looking to Youtube so that you can continue to listen to it. Syaoran is a solid character and definitely someone that you can root for. He has several plot twists (As with everyone else) but none of them take away from the fact that he’s a good character. His fighting skills are pretty good and they keep on improving as the series goes on. The fact that there is another Syaoran is definitely an interesting plot point that may have been left hanging, but it was still epic. Fai has a very high degree of magical ability, but since he decided not to use it anymore so we don’t really get to see his abilities in action. Even without them, Fai has shown that he’s very proficient at hand to hand combat. He tends to give Kurogane a hard time, but he’s pretty nice to everyone. He jokes around the most and Mokona always helps him. He seems to have a dicey past, since he has sealed someone away and had to hide by escaping the dimension. Unfortunately, the plot doesn’t return, but it’s a good concept. Kurogane is the tough guy who has a lot of battle experience. He’s been wielding a blade for a while and he really just wants to go back home. The Princess of the land banished him from the dimension since he was hurting too many people and also cursed him. Whenever Kurogane destroys someone, he loses a bit of his power, which can definitely be distressing. Kurogane is definitely a solid character and he gets more friendly with the others as the series goes on. There are several other characters who are pretty solid, but they’re scattered through the dimensions. Chaos and the other guy who could cross dimensions definitely made for some solid villains. The mysterious figure vanished and we never saw him again, so that plot should be interesting. So, the only negative to the series would probably be the fact that most of the plots don’t end. The series ends with nothing being resolved and feels like it was cancelled. There is a sequel in the form of an OVA, and you can see the rest by checking out the manga, but it’s sad for those who were stuck with the anime. Even so, the anime is definitely solid and having an open ending could be a nice change of pace. I wouldn’t really say that there are any other negatives. The soundtrack is great, the animation is superb, the characters are fun, and the series is over 50 episodes. Some of the characters may have some mild romance, but it’s really mild so you can ignore it for the most part. I highly recommend checking the series out. Since I own the series, I’ll likely be watching it again in the future. It’s the perfect anime for those who want fights, but a deep plot to go along with it. This entry was posted in 8 Star TV Shows, Reviews, TV Show Reviews, TV Shows by dreager1. Bookmark the permalink.